Ahead of the presidential election coming up in 2019 in Nigeria, the All Progressives Congress (APC), in Delta State has asserted that the incumbent, President Mohammadu Buhari, has no challenger either in the major opposition, the Peoples’ Democratic Party (PDP) or in any other party. Speaking in an interview on Tuesday evening, the leader of the All Progressives Congress in the state who doubles as Delta North leader of the party, Chief Engr. Hyacinth Enuha, said the PDP cannot produce a candidate “who will face President Buahri. Then we know that we are ready for competition but as I speak to you now, they have about eight. Let them finish their primary and bring out somebody and then we will know whether that person can stand Buhari or can beat Buhari”, he mocked PDP. On the leadership tussle rocking the party in the state, Enuha, stated that the party chairman, Prophet Jones Ode Erue, is engaged in jamboree and pursuing shadows instead of doing the right thing as required of him by the national chairman of the party, Comrade Adams Oshiomhole, in their meeting in Abuja. Hear him: “let me be honest with you, when the national chairman called us to Abuja that is, the two tendencies; the Ogboru/Omo-Agege tendencies and the O’tega/Enuha tendencies, we went there. 10 from Ogboru/Omo-Agege and 10 from O’tega/Enuha tendencies and then six or so from the minister being neutral and after a lot of talk and suggestions, the chairman made a pronouncement that he has sworn in Prophet Jones and that before he swore in Prophet Jones, he waited for about two weeks before he did it, je was expecting that people from the other tendencies will come and meet with him and tell their own side of the story but they never did and he has gone ahead to swear in Jones. “And that he will stick with Jones but there is no tendencies that can win elections. His suggestions was that Jones should now integrate (bring everybody together), for the Jones exco, that is, state exco because they are not more than 27 people, he can thinker that and bring in … people should be ready to step down so that he can bring some people to accommodate other tendencies but for the ward excos and local government, there will be harmonization and that the minister will handle that, we setup a committee to do the harmonization at the ward and local government level so we came back. “I had expected that as soon as we came back because of time constrain, Jones will swing into action and begin to integrate but that was not what I saw instead Jones was going round doing consultation and I don’t understand what he is consulting. Instruction has been given for you to carry out an assignment, is either you carry out the assignment or you go and do jamboree and he has decided to go and do jamboree not doing the assignment he was mandated to do. “Immediately I concluded that he was not sincere, they sent me a text that they wanted to see me, I refused to see them because they were not sincere and I was proved right because after he has gone round the jamboree, he now wrote a report mentioning all the people he visited to consult and gave the impression that they were all happy and that they have all agreed to work together. I was laughing because as far as I am concern, he has not said anything and of course in today’s paper (Vanguard) you see it O’tega came out and refute everything and threw everything into the dustbin, which is true. “But the hope I have is that, if we have direct primary, all that becomes academic. We don’t need exco to go for primary and win because it is the people not the delegates from the exco that will decide and that was why I didn’t even bother myself. So, like I was saying there is no harmonization and there is no sign there will be harmonization but I am not bothered as long as we have direct primary”. 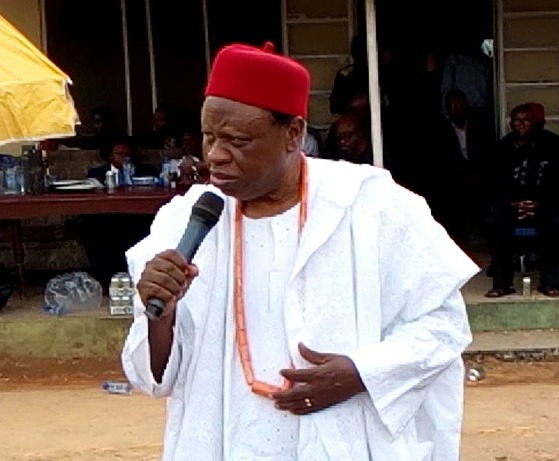 He assured that the quest for Delta North to produce the next governor in replacement of the incumbent would not be jeopardized, “all of them have given me their word that they will do only one term”, stressing that anyone of them who becomes the governor and flout the gentleman agreement, would be dealt with by the party. He said the defection of the former governor of the state, Dr Emmanuel Eweta Uduaghan, to the party “is a big advantage”, as his achievements and human capital development while he held sway as governor of the state was enough to bring victory to the party come 2019.